ICT applications have enormous potential for improving rural lives. Because of advances in ICTs and the accessibility and widespread use of mobile technology, smallholder agriculture is becoming increasingly precise. Through market information services, the data from satellites, drones, the internet and other sources can be transformed into useful information for farmers, traders and policy-makers. But ICT projects often tend to be knowledge based and to generate a huge amount of information. Thus, sharing knowledge during and after projects is widely encouraged. Shared knowledge and expertise underpins multi-stakeholder partnerships – a key instrument in achieving the Sustainable Development Goals, particularly in developing countries. Many ventures have difficulty in identifying and adopting sustainable business models. Scaling up is still proving difficult. Donors and governments have not yet found public–private partnership models that work. After the ICT4Ag International Conference in Kigali 2013, CTA launched a call for grant proposals in 2014 to accelerate the process of beneficial adoption of ICTs for agriculture within selected agricultural value chains and policy processes. The call aimed at exploring viable models by contributing to effective implementation of ICTs within the agricultural sector through proof-of-concept activities across African, Caribbean and Pacific (ACP) countries in order to stimulate their adoption and scaling-up. Five grants were awarded and the activities have been implemented between August 2015 and October 2015 in Antigua, Belize, Barbuda, Trinidad and Tobago, Burkina Faso, Ivory Coast, Ghana, Mali, and Sudan. eLEAF Competence Centre, a Netherlands-based high-tech company that uses reliable, quantitative data on water and vegetation coverage to support sustainable water use, increase food production and provide environmental protection systems, will be scaling up its satellite-based information services at the Gezira Irrigation Dam in Sudan to provide targeted delivery of extension services to farmers. Read more. RONGEAD, a France-based international network system made up of NGOs, technical specialists, international institutions and businesses that provides market information services, will use the grant to improve its current initiative and scale it up through market analysis, training and capacity building, provision of information and advice and delivery of a business intelligence service to improve the competitiveness, profitability and ability of smallholder farmers to manage business risks in food chains in West Africa. Learn more. Syecomp Business Services, a private-sector provider of geographic information system (GIS) services based in Ghana, will use its grant to develop a proof of concept and explore business models for the adoption of geospatial technology (GIS/global positioning system applications), dissemination of agro climatic information and mFarm actor-chain interactions in Ghana. Read more. The University of West Indies, a public-sector research institute located in Trinidad and Tobago, will use its grant to extend and scale up an existing suite of web and mobile applications (mFisheries) for small-scale fisheries. It will also explore a novel co-management delivery model for ICTs amongst various agents in the small scale fisheries ecosystem in the Caribbean. Read more. Yam Pukri, a non-governmental organisation (NGO) based in Burkina Faso, will use the grant to improve the monitoring and implementation of agricultural policies using ICTs, thereby empowering smallholder farmers to contribute to the agricultural and rural development policy processes. Read more. Farmerline Ltd. Farmerline has a mobile-web based application that communicates timely and relevant agricultural information (such as weather alerts, best farm practices, financial tips, market prices and market access) to farmers. Its challenge lies in ensuring mobile app users are fully capable of using and benefiting from the functions of the app. Read more. Ensibuuko. It is an early start-up technology enterprise that facilitates development solutions geared to increasing access to finance and information services to smallholder farmers. With its core banking and information platform, “Mobile Banking Information Systems” (MOBIS), Ensibuuko seeks to increase access and efficiency to financial services and information to both the rural financial institutions and farmers. Ensibuuko won the first ‘Hackathon’ organised by CTA during the ICT4Ag Conference 2013. Their main goal for the Apps4AgLO was to build capacity of target users to ensure successful adoption and use of MOBIS platform to improve agricultural productivity. Read more. Communication strengthens visibility in project reports and other knowledge products, making it persuasive, readable, and factual. 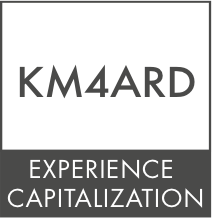 But communication is one of the numerous tools that make up the KM family. Before communicating, an important process takes place, called ‘knowledge harvesting’. ‘Knowledge harvesting is a structured process of identifying and capturing vital implicit knowledge, transforming it to explicit. It uses a variety of approaches, including relating a story, interview, coaching, writing, and documenting. Through these techniques, projects can generate a variety of information to communicate using various formats to different audiences. By Laura Eggens. A documentation workshop was held in Kenema in November 2016. Using a pictorial approach, as is used in GALS, 22 of the champions learned how to organise and share their personal experiences. By Marc Lepage. The UNDP Africa Adaptation Programme started a capitalization process with a workshop in Maputo, in 2012. It followed a set of seven steps which included planning, the identification of each experience, and ME as a cross-cutting and on-going activity. By Alice van der Elstraeten. The “Capitalization of good practices in support of agricultural production and food security" project tested and adapted different methodologies in Niger and Burkina Faso, between January 2009 to June 2013. By Esteban Tapella. The DAS systematization process in Argentina tried different steps to make sure that all stakeholders were involved throughout the whole process, and that key lessons would emerge. By Shalini Kala. 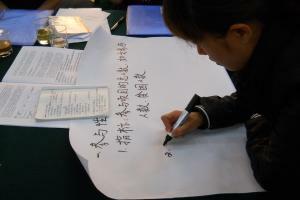 Both the CCA-RAI programme and ENRAP promoted a systematization approach in India and China, introducing it as a methodology to document learning. Although both initiatives were completed a few years ago, the lessons drawn are still valid.